Above command shrinks the database to the point where there is no free space left. It may be useful in some situations, but a more common version is where we reduce the space to a pre-defined amount. In the below example, we reduce the free space down to 25%. Free space created by moving used pages at the end of the physical file (MDF) to the free locations in the beginning or middle, to create contiguous free space at the end. The resultant free space is not necessarily returned to Operating System (that’s good). Please note that the free space is not returned to the OS i.e. physical file size is not reduced; And this ‘NOTRUNCATE’ only applies to data files (not log file). When you want to release that free space to the OS, you want to use TRUNCATEONLY option. This option does not rearrange any pages; Just releases the existing free space to Operating System. Before you shrink database, the follow command must be run to understand the amount of free space available; Is there any to be freed? We covered in a previous post here. Do not run this command in production databases. Careful measures need to be considered before we jump to this option, as this is the “last option” measure. Also, in production environment, do not set the AUTO_SHRINK database option to ON. Shrinking does not reduce fragmentation in tables & indexes. Occassionally, we need to introduce forced wait or delays when running some T-Sql statements. There is an easy way to accomplish it. SQLIOSim is a native tool available as part of Sql Server installation (starting 2008). It is located in the Binn folder. First let’s open the SQLIOSim.exe application (Run as Administrator). Depending on the number of drives, you have, SQLIOSim automatically lists them all in the UI. We could pick and choose which ones we want to stress test using the “Remove” button on the top right corner. All the sqliosim.mdx, sqliosim.ldx, etc are the dummy files created, on those drives, to simulate traffic in and out of those files to test the performance of the IO drives. 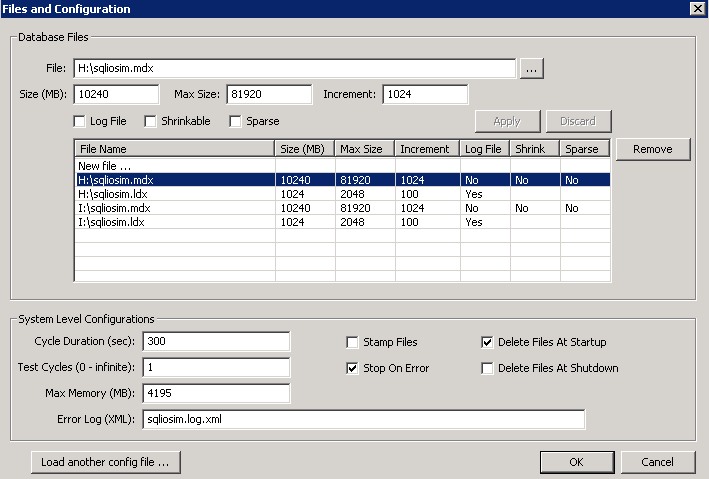 Select file in each drive and enter corresponding values for mdx & ldx files. See the image below, for a small size database test, with slightly different values entered. Hit the start green start button at the top left corner to begin the test. Depending on the configured values, the test could run from several minutes to an hour. It uses the configured values to simulate database IO traffic including occasional file increments. If you open Resource Monitor, and go to “Disk” tab, you’ll see a lot of activity. For more information, highlight the “SQLIOSim.exe” image from the list, to see more details. Once the test is completed, sometimes you’ll see a bunch of warnings and a huge log file with test results. In particular we’ll cover one section that is most relevant to this topic. Scroll all the way to the bottom, and your see something like for each drive/file. The above summary test results is displayed for each data/log file for each drive selected for testing. For this, we’ll focus on Target & Average Duration and Throttle metric. Average Duration shows the average time it took to perform actions on this file. Average over the whole duration of the test, including all read/write/etc activities. When this average duration exceedes Target Duration, SQLIOSim tries to throttle the load to improve the throughput while keeping the latency to a minimum. So, in the above example, the Average Duration is 67 ms; But SQLIOSim had to throttle the load 9656 times to make sure maximum through put is derived out of the drive. Keep in mind 67 ms is average, so some tests might have gone above 100 ms (Target Duration) that resulted in Throttling. Average Duration as small as possible. Throttling to as small as possible. Please keep in mind that these are relative numbers. Depending on the underlying hardware, some numbers vary; And the overall goal is to keep the numbers as close to ideal as possible. Sometimes, we run into a “Access Denied” error for SQLIOSim in creating these mdx/ldx files. First, make sure SQLIOSim is “Run as an Administrator”. After trying the above, if you still get the same error. Try this. One workaround that worked for me is to pre-create some dummy files on each drive. Then any subsequent runs will work automatically. Every once in a while there comes a need to reseed identity values for some tables in our QA environment. This script has come in handy every time. There are variations to this script, but this provides a god starting point. For more information, please review this MSDN article.